I first reported on Magnolia Scale (Neolecanium cornuparvum) this season in June when the maturing females were "puffing-up" and pumping out honeydew (see BYGL Alert, "Magnolia Scale is Pumping-Out Honeydew," June 16, 2017). My lengthy BYGL post included a description of the life-cycle for this "soft scale" (Family Coccidae) as well as information on management options. This update is based on revisiting the infestation cited in that report. I also must include some new management information that we learned from Dan Potter (University of Kentucky, Entomology) and his Ph.D. graduate student, Bernadette Mach, during our 20th Annual Bluegrass-Buckeye BYGLive! 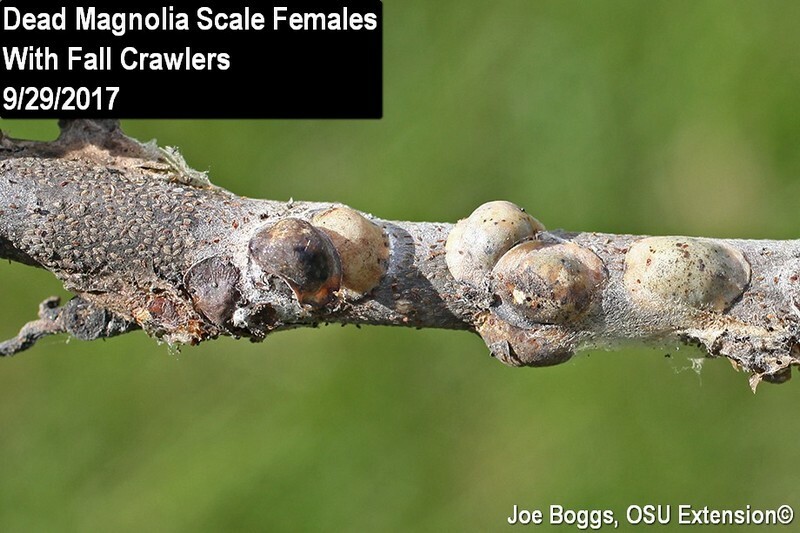 held last Monday in Versailles, KY.
Magnolia scale crawlers have settled onto plant stems in southwest Ohio. According to the literature, this makes them a possible target for two types of topical applications: horticultural oils and standard insecticides. However, there is an important caveat. Both of these strategies require that the chemicals come into direct contact with the crawlers; they will not be killed if the bodies of dead female scales are stacked on top of the crawlers. Anything that interferes with direct contact, including poor spray coverage, will reduce the efficacy. This is particularly true of horticultural oils. Keep in mind that each female crawler that escapes being killed may produce thousands of offspring. I wouldn't put all my eggs in this single control basket. Various university-based online references also note that magnolia scale can be effectively suppressed with single applications of the neonicotinoid systemic insecticide imidacloprid (e.g. Merit). The two effective "treatment windows" noted in the references are late summer to early fall, before crawlers stop feeding for the season; or sometime in May after overwintered nymphs start feeding. However, Bernadette provided some preliminary data from a study she is currently conducting that casts doubt on the safety to pollinators if the application is made in late-fall or very early spring. She found unacceptable imidacloprid residues in the nectar of Foster's Holly flowers if applications are made in the fall or in the spring prior to flowering. She observed safe levels if applications were made after flowering. While her studies were performed on a different woody plant, her results should instill a note of caution when making applications prior to flowering. Although not often included with groups of "pollinator beacons," magnolias do attract pollinators; I've taken a number of pictures of various pollinators including European honeybees buzzing magnolia flowers. So, it would be best to delay the imidacloprid application until after the targeted magnolias have finished flowering. Dan reported that he conducted a study several years ago on the University of Kentucky campus to see if soft scales could be controlled using a very direct approach. He had a group of volunteers armed with bathroom toilet brushes and clad in protective suits scrub branches to physically remove maturing female soft scales. Dan noted that while the results weren't 100%, they were effective enough to make this a viable option for reducing soft scale populations on small trees. Of course, the added benefit is that I doubt soft scales could become resistant to this brush-off!